10 minVault enables the combined database secret engines to automate the rotation of root credentials. In the AppRole Pull Authentication guide, the question of how best to deliver the Role ID and Secret ID were brought up, and the role of trusted entities (Terraform, Chef, Nomad, Kubernetes, etc.) was mentioned. This intermediate Vault guide aims to provide a simple, end-to-end example of how to use Vault's AppRole authentication method, along with Terraform and Chef, to address the challenge of the secure introduction of an initial token to a target system. 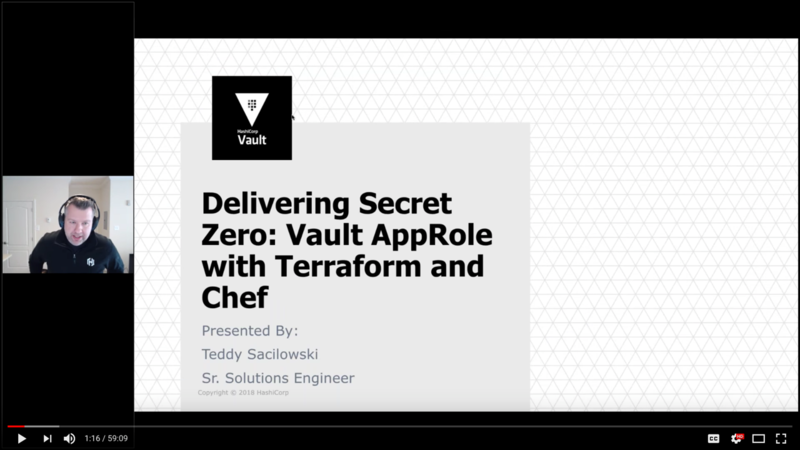 The purpose of this guide is to provide the instruction to reproduce the working implementation demo introduced in the Delivering Secret Zero: Vault AppRole with Terraform and Chef webinar. NOTE: This is a proof of concept and NOT SUITABLE FOR PRODUCTION USE. The goal of the AppRole authentication method is to provide a mechanism for the secure introduction of secrets to target systems (servers, applications, containers, etc.). The question becomes what systems within our environment do we trust to handle or deliver the RoleID and SecretID to our target systems. Use Trusted Entities to deliver the AppRole authentication values. For example, use Terraform to deliver your RoleID or embed it into your AMI or Dockerfile. Then you might use Jenkins or Chef to obtain the response-wrapped SecretID and deliver it to the target system. AppRole allows us to securely introduce the authentication token to the target system by preventing any single system from having full access to an authentication token that does not belong to it. This helps us maintain the security principles of least privilege and non-repudiation. The important thing to note here is that regardless of what systems are considered as Trusted Entities, the same pattern applies. This guide assumes that you are proficient enough to perform basic Terraform tasks. If you are not familiar with Terraform, refer to the online documentation. Clone or download the demo assets from the hashicorp/vault-guides GitHub repository to perform the steps described in this guide. Chef cookbook (/chef/cookbooks): A sample cookbook with a recipe that installs NGINX and demonstrates Vault Ruby Gem functionality used to interact with Vault APIs. /terraform-aws/mgmt-node: Configuration to set up a management server running both Vault and Chef Server, for demo purposes. /terraform-aws/chef-node: Configuration to set up a Chef node and bootstrap it with the Chef Server, passing in Vault's AppRole RoleID and the appropriate Chef run-list. Vault configuration (/scripts): Data scripts used to configure the appropriate mounts and policies in Vault for this demo. The scenario in this guide uses Terraform and Chef as trusted entities to deliver RoleID and SecretID. For the simplicity of the demonstration, both Vault and Chef are installed on the same node. Terraform provisions the node which contains the RoleID as an environment variable. Chef pulls the SecretID from Vault. This provides a quick and simple Vault and Chef Server configuration to help you get started. NOTE: This is done for demonstration purpose and NOT a recommended practice for production. In this phase, you use Terraform to spin up a server (and associated AWS resources) with both Vault and Chef Server installed. Once this server is up and running, you'll complete the appropriate configuration steps in Vault to set up our AppRole and tokens for use in the demo. If using Terraform Enterprise, create a Workspace for this repo and set the appropriate Terraform/Environment variables using the terraform.tfvars.example file as a reference. Follow the instructions in the documentation to perform the appropriate setup in Terraform Enterprise. Task 1: Change the working directory (cd) to identity/vault-chef-approle/terraform-aws/mgmt-node. Task 2: Update the terraform.tfvars.example file to match your account and rename it to terraform.tfvars. NOTE: If your VPC, subnet and EC2 key pair were created on a region other than us-east-1, be sure to set the aws_region value to match your chosen region. Task 3: Perform a terraform init to pull down the necessary provider resources. Then terraform plan to verify your changes and the resources that will be created. If all looks good, then perform a terraform apply to provision the resources. The Terraform output will display the public IP address to SSH into your server. The Terraform output will display the public IP address to SSH into your server. Task 4: Initial setup of the Chef server takes several minutes. Once you can SSH into your mgmt server, run tail -f /var/log/tf-user-data.log to see when the initial configuration is complete. When you see the following message, the initial setup is complete. Option 1: Run the /home/ubuntu/demo_setup.sh script to get up and running, and proceed to Phase 2 - Provision our Chef Node to Show AppRole Login. Option 2: Continue onto Step 3: AppRole Setup to set up the demo environment manually. First, initialize and unseal the Vault server using a shortcut. This is a convenient shortcut for demo. DO NOT DO THIS IN PRODUCTION!!! Refer to the online documentation for initializing and unsealing Vault for more details. These setups only need to be performed upon initial creation of an AppRole, and would typically be done by a Vault administrator. Now that you have your Vault server unsealed, you can begin to set up necessary policies, AppRole auth method, and tokens. This is the policy that will be attached to secret zero which you are delivering to our application (app-1). "description": "Demo AppRole auth method"
Now, you are going to create an AppRole role named app-1. Now, you're ready to configure the policies and tokens to Terraform and Chef to interact with Vault. Remember, the point here is that you are giving each system a limited token that is only able to pull either the RoleID or SecretID, but not both. At this point, you have a client token generated for Terraform and another for Chef server to log into Vault. For the sake of simplicity, you can put the Chef's client token (secretid-token.json) in a Data Bag which is fine because this token can only retrieve SecretID from Vault which is not much of a use without a corresponding RoleID. Now, create a Chef Data Bag and put the SecretID token (secretid-token.json) along with the rest of its metadata. WARNING: Unencrypted data bag detected, ignoring any provided secret options. Let's write some test data in the secret/app-1 path so that the target app will have some secret to retrieve from Vault at a later step. $ vault write secret/app-1 username="app-1-user" password="\$up3r\$3cr3t!" At this point, just about all the pieces are in place. Remember, these setup steps will only need to be performed upon initial creation of an AppRole, and would typically be done by a Vault administrator. To complete the demo, run the chef-node Terraform configuration to see how everything talks to each other. Replace the variable values in terraform.tfvars.example to match your environment and save it as terraform.tfvars like you have done at Step 1. Update the vault_address and chef_server_address variables with the IP address of our mgmt-node from above. 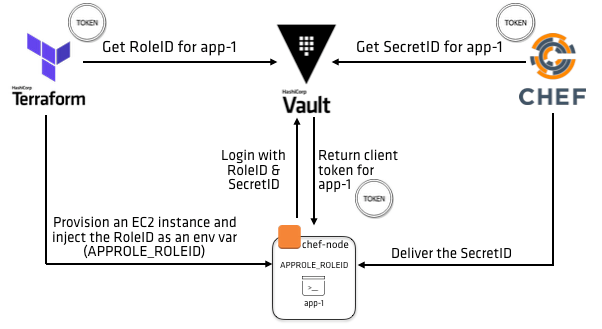 Update the vault_token variable with the RoleID token from Task 1 in Step 4. $ cat ~/vault-chef-approle-demo/roleid-token.json | jq ".auth.client_token"
Perform a terraform init to pull down the necessary provider resources. Then terraform plan to verify your changes and the resources that will be created. If all looks good, then perform a terraform apply to provision the resources. NOTE: If the terraform apply fails with "io: read/write on closed pipe" error, this is a known issue with Terraform 0.11.4 and 0.11.5. Please try again with another Terraform version. The Chef recipe can be found at identity/vault-chef-approle/chef/cookbooks/vault_chef_approle_demo/recipes/default.rb. $ sudo chef-client -j "/etc/chef/first-boot.json" -E "_default"